Hoodoggie we’re back with a new season of Dark Matter as we get ready to answer to all those pressing questions. Like, Is Nyx dead? (Probably) Is Four going to lose his Empire? (Most likely) Are the crew of the Raza screwed? (Always) Will there be betrayal? 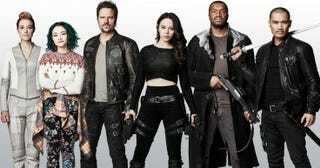 (Of course) Welcome to the Dark Matter season 3 episode 1 & 2 “Being Better is Harder” & “It doesn’t have to be like this” spoilerific reaction thread where you can share your thoughts on the show as it plays out or after it’s over. 1. Someone on the crew (Probably Three) commenting on how hard it is for them to try being good guys. 2. No idea, could be referring to anything.